This weekend, I was rummaging through the workroom, taking photos of needlework tools and accessories that I have, but have never shown you. This was while I was supposed to be cleaning up. I never quite got around to cleaning up. Once upon a time, I was a bare-bones stitcher. I didn’t have tools and accessories, beyond the very basics. But one thing I noticed while writing about embroidery here on Needle ‘n Thread is that needleworkers of every ilk and every persuasion of needlework just love their accessories and tools. So I started noticing accessories and tools. Can you guess what happened? Now, I love discovering unique needlework-related tools and accessories – the kind that you don’t see everywhere. The kind that are hand-made. Personalized. Interesting. Little lovely things that make stitching easier or simply more pleasurable. So today, I thought I’d show you this particularly neat little gadget that’s new to me. I’ve seen plenty of magnetic needle keepers out there – especially the kind that rest on your fabric – but I’ve never seen one quite like this! I love it! This is a magnetic needle keeper made by Adan Aker, at Akerworks, which is a family-owned design and manufacturing company in Tennessee. They make unique things, like collapsible bobbins for spinning (they can be taken apart for storage or travel), baritone ukeleles, wooden pet name tags, and – what interests me particularly – these magnetic needle keepers. The needle keepers are made from a lovely, smooth cherry wood and backed with walnut. Inside, there’s a very strong magnet imbedded (which is not visible at all). Upon that magnet, you can put your needles. The needle keeper has the option for a 24″ sterling silver chain, but if you don’t want to wear it around your neck, you can skip the chain. It can be attached to a chatelaine, it can be hung on the edge of your wooden embroidery frame – you can put it anywhere you want, pretty much! Just so you know, it is a very strong magnet – a neodymium magnet (a rare-earth magnet). Remember my Ernest Wright scissors from last week? Well, they aren’t light-weights. They’re pretty hefty for fine scissors. The magnet not only picks them up, but…. …I can swing them around and they don’t budge! Ok, so it wasn’t my over-the-head-sweet-cowboy-lassoing-move, as far as swinging goes. I’m almost smart enough not to do that with good scissors. (Or any scissors…) But it was a decent swing. And they held right on. 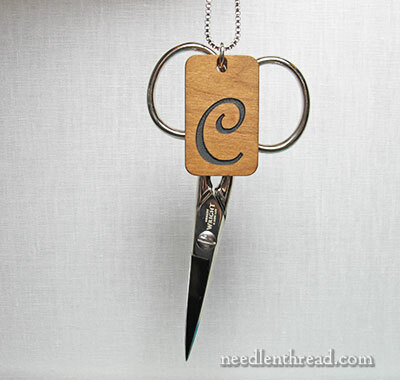 I can put the chain around my neck and rest my scissors on it, or rest needles on it while I’m working. And even if I get up and move around in a normal way (I didn’t try hyper calisthenics, admittedly), they don’t go anywhere. Of course, there’s the typical caveat when you’re dealing with very strong magnets: if you use any kind of medical device that might be affected by it, you’d probably give this a miss, as far as a necklace goes. And you’d want to keep it away from sensitive electronics. 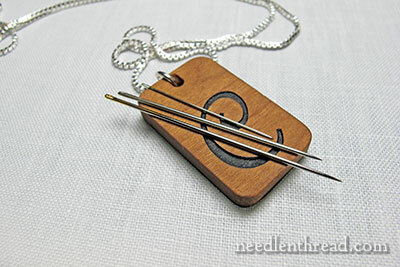 What I like about it: it’s unique, customizable (there are options for customizing the needle keeper shown here, including initials, quilt square designs, flowers, a couple animals), it’s made out of beautiful wood (I love beautiful wood! ), and it’s made at a family owned business, by people who make interesting things. The needle keepers are just over an inch high (just around 1.25″) and less than an inch wide (right around .75″ wide), and just a hair over 1/8th” thick. I got mine directly from Akerworks. I don’t know if they are available through retail needlework stores – I suspect not. But you can always ask! What about you? Do you have any unique needlework tool or accessory that you just love? Was it a gift, or did you get it for yourself? Or are you more of a bare-bones stitcher? 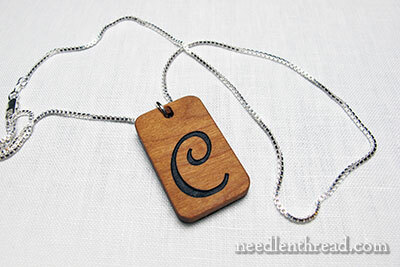 Or new to the whole notion of accessorizing your hobby? What are your thoughts? I’d love to hear your take on needlework tools and accessories – do you like them? Do you like to hear about them? Do you like reading about them, or would you rather skip ’em altogether? Feel free to expound below! June 4, 2013 Needle Tins & Needle ID Cards – A Give-Away! Your magnetic needle holder is lovely Mary. The only thing I would not do with it is hang my scissors on it while around my neck, I’m afraid the scissors would make a whole in my shirt! Which I have done before as I have one I use while sewing on my sewing machine. I have a lovely gadget that my husband made me, it is wonderful. Im sure you’ve seen them before they are a block of wood, mine is Black Walnut, and has a slight angle on the bottom. I had my husband drill 5 holes in it, one for my highlighter and a few for tweezers scissors etc. There are also 6 small round magnets on it that I keep my loaded needles on while stitching. That way I am not constantly loading and unloading needles. It is my favorite gadget right now as I use it every day. I like reading about tools, but in practice I am mostly a bare bones stitcher. I don’t have any space to keep a bazillion gadgets so I have to keep my craft stuff to a minimum. My grab and go tool box also keeps my projects, so the magnet I use is a flat refrigerator type that our vet gave us. I use that because it takes up nearly no space in my tool box. Those rare-earth magnets look great but because where I sit to stitch is near my computer, I doubt I will be buying one. The largest tool I have in my box is an Ottlight flip light for on the go, everything else takes less space than that. I really like needlework tools/accessories and I love hearing about them. I don’t have any unique tools but my favourites are my strawberry pin cushion with the little hanging bit which sharpens your needles, I love the mellor which I use for goldwork and my awl for straightening thread, my tweezers I constantly use for all sorts of things and my bohin needles I love, my Sew mate scissors and my telescopic magnet which you wrote about brilliant thing for those lost needles and finally those little Clover wonder clips that you wrote about last year I use these all the time when covering my embroidery for the the evening. So thanks Mary for all your tool talk past and present which I love. I do like the magnet and thanks for review. I luv accessories, especially when it is an everyday item we all have in our houses. I did have a thing around my neck for scissors but the tip of the scissors put holes in my jeans and slacks. Don’t use it anymore. But I sure miss it. Hello, Mrs. Corbet! Allow me a tiny sigh because I dreamt about the Hummer last night in anticipation of seeing “the fix.” I really am so obsessed with that project! Now, getting on topic… I am a bare-bones girl thus far. I’m still trying to figure out what it is I need to do the embroidery that interests me the most, and choosing the right sorts. I know I need scissors, a few more hoops in different sizes, I need to build up a ground fabric collection, and start moving beyond DMC floss. I also need a needle-minder! But I’m not sure this one is the one for me! All I know is that I’m so grateful for this blog and how you show and explain the options for people like me to make our choices! On Red Beolly’s blog, she made a pin keeper out of a covered button and a super strong magnet. It can’t be worn around your neck on a regular chain, but could be pinned on or probably worn on a chatelaine since it has the button back. No way as pretty as this one, but a similar idea. After reading your post, I went straight to order one for myself and one for my daughter, but the big, fat warning on Akerworks’s website about the magnets stopped me from doing so. The magnet cannot even be positioned near a computer (or likewise, I assume, cell phone, tablet, etc.). Since any of those devices may be within fairly close proximity when I’m stitching, I would be nervous all the time when using the needle keeper! Too bad, it’s a beautiful piece. Well, I think it depends on what you mean by near. In the same room, at a table next to you, or leaning over the computer? I use mine with an iPad sitting on the table right next to me, with my camera right there, etc. The idea, I think, is to keep the the magnet directly off the devices, but it doesnt mean you can’t use it in the general vicinity. Thanks, Mary. That helps a lot! hi I love reading all of the history and learning about all things needleworks. Thanks, Cindy! I’m glad you like it! It looks beautiful and sounds lovely, BUT I’m leary about weak magnets in this day and age let alone a strong one! My iPad and now new iPhone are contantly being used by me and most likely would end up on the same end table as this magnet. Perhaps not directly ON each other but a few inches is still pretty near! I have a telescoping magnet that says it can pick up a bowling ball, if I need to get it out for some reason, I use it and put it right back on the shelf. I realized the other day I have been storing a couple of CDs with photos right next to it. I haven’t yet tried the cds to see if they still work. I’m not optimistic. So strong magnets are not very welcome in our house with all our tech toys! Thanks gor the review! CDs are not magnetic, so they will be fine. Just don’t store a USB stick or digital camera next to your magnet. I really love hearing about new gadgets for needlework, since it is a new hobby that I am starting to get into. My husband built me a sewing table for my Bernina Sewing Machine that I bought in 2000. We were living in a basement apartment then. He built it to hold up to 100 lbs. My sewing machine and cabinet he surprised me with fits perfectly with the table. The legs are built out of PVC pipe and end caps to keep it steady. I figure learning embroidery I can incorporate this into my quilting because I love the handiwork it involves. I enjoy so much your email newsletters too. Thank you so much for the great tips and techniques. I collected old sewing tools before they got so popular. I just love using them in my cabinets with old lace and pettipoint. I rarely use my needle minder since I learned to stitch without one. I am sure they work well. Love your blog, keep up the good work. Mary I have several needle minders, the cutest is a little glitter stoned frog with a circular magnet on the bottom so gentle you could wear it as an ear ring. The one I enjoy the most and use constantly when I am working on my hand quilting is one that is attached to the side of my quilt thread flat bottomed spool holder. The one I use daily is the magnetic paper clip holder, it is great for picking up loose needles and I can never seem to find my large magnetic pin holder. My favourite portable one is a little fancy mason jar, that I made a silk ribbon embroidery design for the top. It is padded on top with a beautiful design stitched and the little jar holds, thread heaven, nippers, needles in their little glass cases, thimble etc., as well as a small pair of scisors. I just pick it up and away I go. I bought a cherry wood jewelry box that has a hinged lid on top and three drawers. The drawers are just perfectly deep enough to put floss bobbins in. So I took it to a woodworker and had him put little wooden dividers in it, so now I have the complete range of DMC floss in numerical order. I started collecting sewing kits, generally old ones made in interesting shapes,(walnuts, vacuum cleaners, etc. My oldest was made in approx.1840. I re-married and when you combine two household, some things had to go. I had over 200 and now am down to about a dozen. Hard to part with them!! Hi Mary, Before I forget I just wanted to say that I’ve been training “Me” to be mindful about my scissors and needles. I must admit I was getting gungho and if I couldn’t find the needle I was just using, then I’d use another one. But that wasn’t very clever thinking. So, I think my “mind” needs to be kept “sharpened”, so it can become my best stitching tool. Thanks Kathy!! I have little fibres of black silk thread clinging to my silk satin ground fabric after clipping back some turkey stitches for a little bee. Thank you, thank you, thank you!! Mary, Thanks for sharing your knowledge and insite. I have been following your site for over a year now and it has helped me re-discover a love for needlework. The tool tips are great. Last year I had ankle surgery and spent a lot of time in bed. While lying there I made a needle roll similar to the one you made. I hade over 200 needles. Now they are organized by type and size in a nice little roll. I am currently making a scissor keeper to clip to my frame. I seem to have a problem keeping track of those little things. Thanks for all your sharing. Looking forward to tomorrows post. I was mostly a bare bones type person before MC, whenI started reading your site….lol…. Before MC the only unique sewing item I had was my floss box. It began life as a flatware chest of my mother’s. The finish had been damaged so she was going to buy a new chest. I asked her if I could have the old chest when she got the new one to use for my embroidery floss bobbins. She said sure. A few weeks later I was visiting with her when her next door neighbor man came over carrying the flatware chest. She had had him restore the finish, not for her but for me. It was a two compartment chest, so I gutted the upper level and the drawer of it’s forms and put thin strips of wood into it to hold my bobbins. I left the knife loops in the lid and they hold scissors, pencils, anything small and long. Mom has been gone since 1986, but my floss box sits in front of my couch always and I think of her whenever I open it. 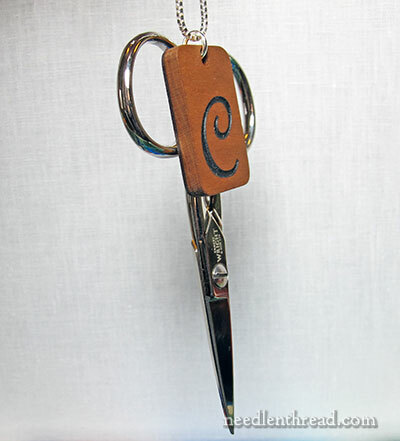 Of course my Gingher scissors are favorites now too! I absolutely adore my Bohin needles! So do these recent acquisitions mean I’m turning into a sewing tool junkie? Thanks Mary for all you have done for and to me….lol..!!!! Keep on tool talking, someday I’ll have a really respectable tool stash! I so enjoy your exploration of tools and accessories; and it’s helpful when making a decision to have your review on the item! Maybe you can assist me in finding a specific tool? You’ve written about your sterling mellore previously – well, I cannot find a sterling one to save my life! All I’ve seen are a couple of gold plated mellores, mellor, melor(e)and I NEED a sterling silver one. Suggestions Mary? Hi, Christine – try a Tanja Berlin. I got mine from her years ago…. I LOVE hearing about other stitchers accessories! Especially when I have to come up with giftables for favors. Thank you Ms. Mary. Although I’ve been doing needlework for most of my life, it has only been in the past few years that I have grown to appreciate the finer tools and accessories. I credit you with much of my appreciation because you have reviewed so many beautiful things that I now have learned to covet!